Despite its designation as America's largest Chick-fil-A restaurant, the fast food chain's first NYC outpost has drawn long lines -- stretching out on the sidewalk -- since it opened its doors near Herald Square last October. 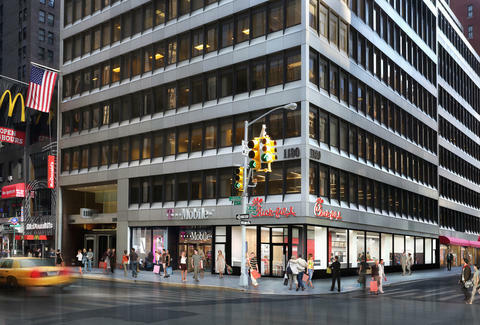 But now, the company is preparing to open a second enormous location in hopes of doubling its ability to sling countless chicken sandwiches and waffle fries to hungry New Yorkers, and of course, continue its ambitious expansion across the city. The new outpost is slated to open on Saturday, April 2nd, at the corner of 46th Street and Sixth Avenue in Midtown -- only nine blocks north of the existing location, and just steps away from Times Square. Chick-fil-A claims the two-story, nearly 5,000sqft restaurant is designed for the neighborhood's on-the-go customers, and a faster ordering system will result in wait times of just six to eight minutes, according to a press release. Additionally, the restaurant will include 26 seats along the windows on 46th Street. It'll be open from 6:30am to midnight every day, of course except for Sunday. The news comes a little over a month since the 37th Street location was temporarily closed after city health inspectors found dozens of violations. And whether you're a fan of Chick-fil-A or not, this new eatery is just the second of several new outposts the chain is plotting to open in Manhattan, the city's other boroughs, and on Long Island over the next few years. Tony Merevick is Cities News Editor at Thrillist and wonders when Chick-fil-A will outnumber Starbucks in NYC. Send news tips to news@thrillist.com and follow him on Twitter @tonymerevick.